Converters of hard-to-treat and thicker substrates will benefit from using an alternative to corona treating—the atmospheric plasma method. 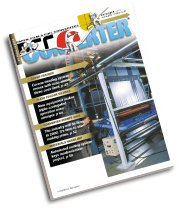 A new production line at Optimum Plastics is the impetus for a new, portable corona treater system from Corotec Corp.
Converters in need of surface-treatment information now may be able to get it from Enercon's surface-treating lab. Enercon Industries Corp. says it's added a Friction/Peel Tester to its laboratory to help customers identify the effects of various levels and types of surface treating.